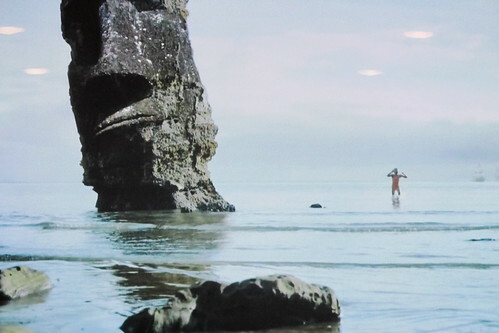 An hour or so later I spotted another Moai, this time in a commercial for granola bars, of all things. A girl is sitting on the dock (eating a granola bar) then she jumps in the lake and imagines a wild adventure in which she swims with killer whales (I hadn’t really been paying attention at this point and assumed this was an ad for Sea World). Then she encounters battling pirate ships and finally washes ashore on a beach with this giant Moai nearby. Who knew granola bars could be so magical? 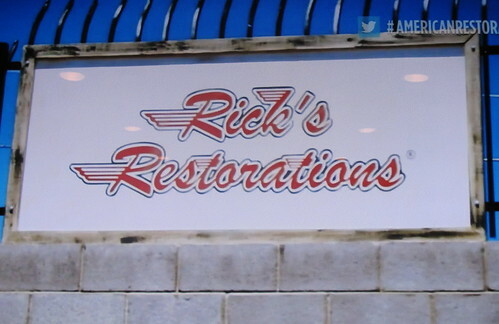 On this History Channel reality show, Rick Dale and his Las Vegas shop fix up all sorts of vintage items — classic Coke machines, slot machines, neon signs, etc. — to make them look new again. Since I’m a fan of retro stuff (and mindless reality TV) we tune in fairly regularly. 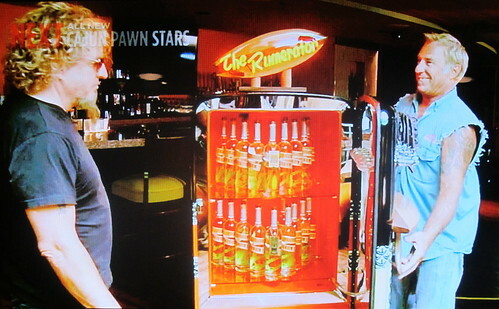 For “Right Here, Rum Now,” which first aired September 26, 2012, Rick’s project for the former Van Halen rocker was to repurpose an old refrigerator into a custom rum dispenser — a “Rumerator,” as they called it. 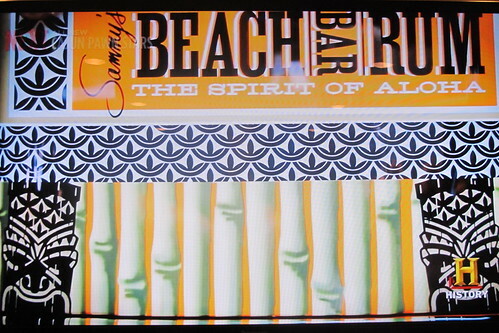 Since Sammy’s rum is distilled on Maui and made from local sugarcane, he wanted the final product to reflect Hawaii and the brand’s tropical lifestyle image. Rick talked over some ideas with Dave, who seemed to be just the right guy for the job (note the tiki tattoo). The Rumerator has some hot rod style to it, with the shiny black top and neon sign. Glasses are placed on a mini surfboard mounted to the front, and the fin cleverly acts as a handle to open the door. A couple nitrogen tanks in the back keep the contents on tap chilled. 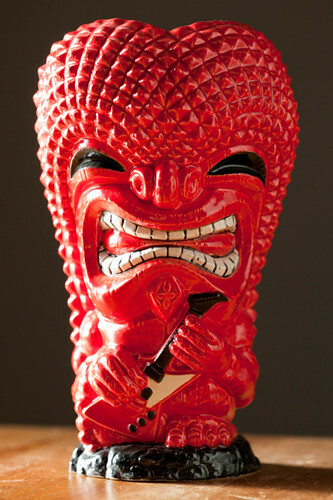 Sammy owns a home on the island, and you can tell he’s also into tikis from browsing his web site, where he can be seen with a tiki surfboard at the end of his holiday message video. 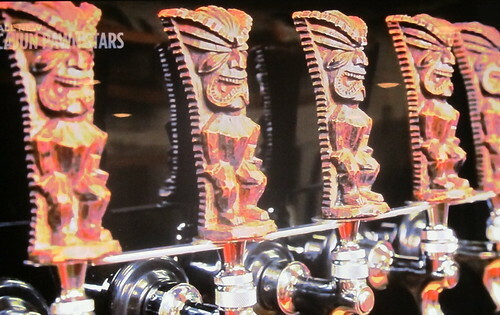 In addition to those taps, there were also two more tikis worked into the design underneath, along with bamboo, sugarcane and a black and white graphic leaf-like pattern echoed from the rum label. 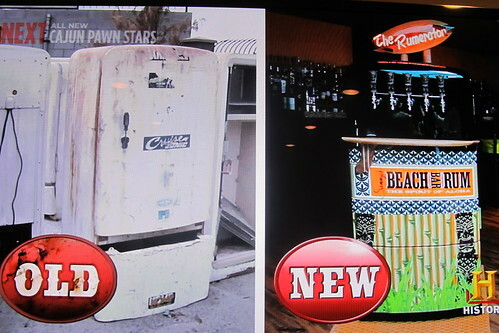 According to the show, The Rumerator was installed for the opening of Sammy’s Rockin’ Island Bar & Grill in Roseville, CA, outside of Sacramento. 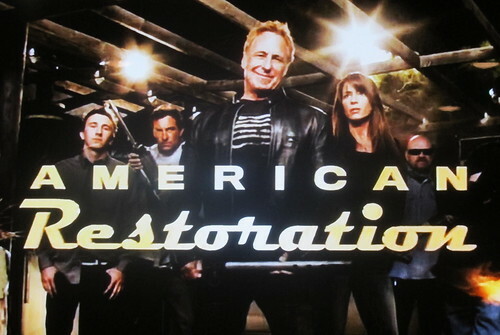 You can catch this episode again on the History Channel on Sunday, January 20, 11:30 p.m./10:30c. 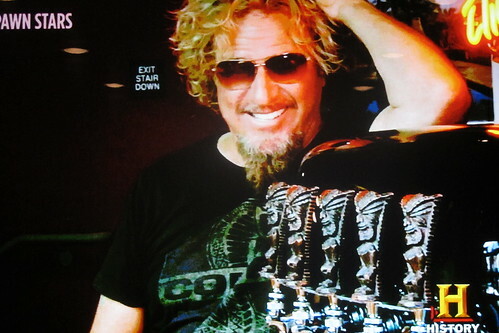 Crazy Al and his band Ape performed at a launch party for Sammy’s Beach Bar Rum, and this spawned a collaboration on a new tiki mug, “Sam Ku,” which is bright red in honor of Sammy’s nickname “The Red Rocker.” (The tiki is even holding a “Sammy Hagar” special edition Gibson Explorer guitar.) Tiki Farm‘s share of the 250 mugs sold out in minutes. However, Crazy Al is offering 25 custom-glazed mugs on eBay. Sign up for his mailing list to get the scoop on that. 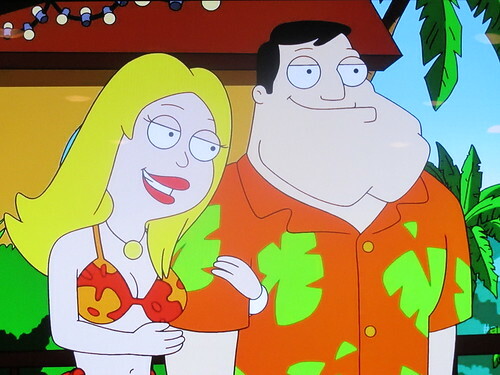 In “Killer Vacation,” which aired on October 7, 2012, the Smith family takes a vacation on an unnamed tropical island, and shenanigans follow. 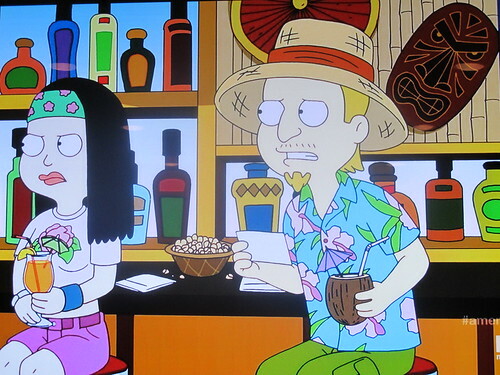 Hayley and Jeff are propositioned by another couple while sipping umbrella and coconut drinks at the poolside bar, complete with bamboo and a tiki mask on the wall. 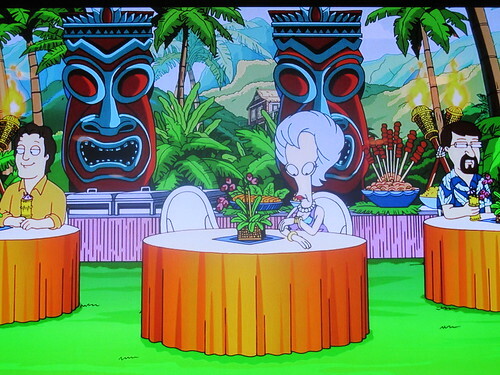 Harder to miss were the giant blue and red tikis decorating the luau that Roger the alien attends later in the episode. 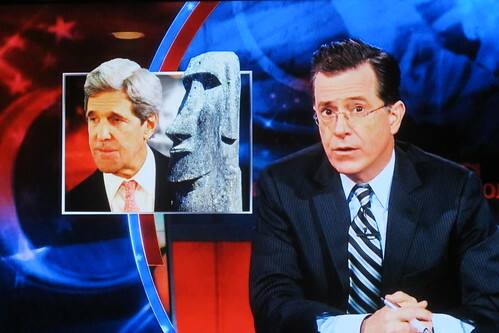 Lots of Party City tiki influence apparent here (even more so in the last picture in this post). 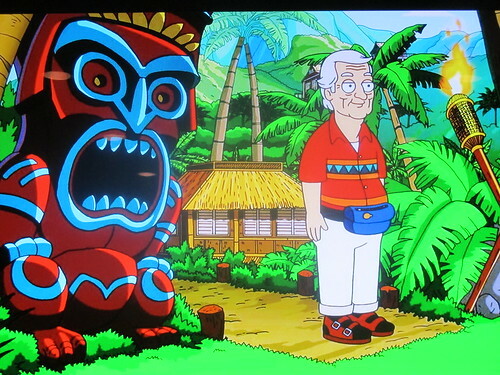 I think somebody that works on this show must be into tiki, since this is the third time we’ve found them and I’m sure there are others that we’ve missed. 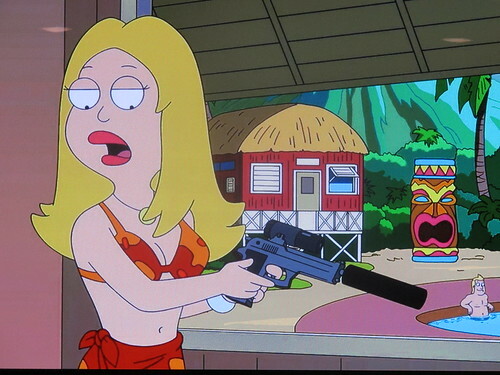 Check out the tikis on “American Dad” Part One and Part Two to refresh your memory.